If you are looking for information on the Great American Shops franchise business opportunity, Great American Shops franchises or Great American Shops franchising, then you have come to the right place. Great American Shops is a trademark licensing company specializing in salads, subs, pizza, and other items made in our one-of-a-kind greaseless, ventless fryer - the Quick n' Crispy Fryer®. Most exciting, unlike a traditional franchise, we offer you more control and flexibility in your business as you own and operate your location as an independent contractor. You don't have to worry about monthly fees being paid out or any advertising fees being charged back to you. Any advertising, promotional giveaways, or specials are at your discretion to establish. 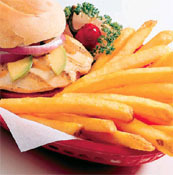 Great American Shops specializes in salads, subs, pizza, and other items made in the Quick n' Crispy Fryer®. 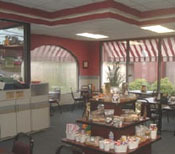 In as little as six minutes, the Quick n' Crispy Fryer® offers lower fat content for your health-conscious customers as they choose from a vast menu selection including chicken tenderloins, steakburgers, chicken, fish or breakfast sandwiches, jalapeno poppers, French fries, onion rings, cheese balls, fish sticks, popcorn shrimp and chicken and much more cooked to order! With such a large variety of product, consumers have an almost endless selection every time they visit your location. Great American Shops also offers a choice of several types of ice cream products. 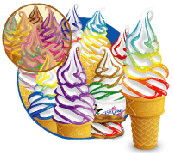 Choose from the Breyer's Hand-Dipped Premium Ice Cream, The Ice Cream Works Station, or a Soft-Serve Machine with FlavorBurst®. Remember, as an independent licensee, all product decisions are up to you! We offer on-site training or you can come to our headquarters in Pennsylvania. Training covers operational methods, marketing programs, and administration procedures. From final site location and equipment set up to continued support, we're here for you every step of the way! Don't Miss Out on This Great Business Opportunity! Great American Shops is looking for ambitious, career-driven individuals who are interested in owning one or more of their own independent locations. With setup costs much lower than a typical franchise and no monthly fee requirements, owning and operating your own independent location couldn't be easier. Get in on this "Great American" Opportunity!